This costume seems to be part of an intriguing project that I likely won’t get to in my book this go-around, alas. Author Camara Dia HollowayPosted on November 25, 2013 August 20, 2015 Format ImageCategories AfrochicTags "Ballet Africain", 1920s, Broadway, costume, costume design, Erte, George White's Scandals, PrimitivismLeave a comment on This costume seems to be part of an intriguing project that I likely won’t get to in my book this go-around, alas. Enduring Afrochic! I am investigating the historical origins of the fashion trend that had powerful currency throughout the 20th century. And it seems that “exotic” Africa will continue to inspire in the 21st century. Love and Theft! Love and Theft! Louis Vuitton, by Marc Jacobs, spring/summer 2014, in Paris. PARIS — The news of the departure of Marc Jacobs from Louis Vuitton overshadowed the final day of the Paris summer 2014 collections. But people in the audience were reminded of the designer’s exceptional skill at creating great fashion moments by this presentation, all in black, of showgirl clothes. 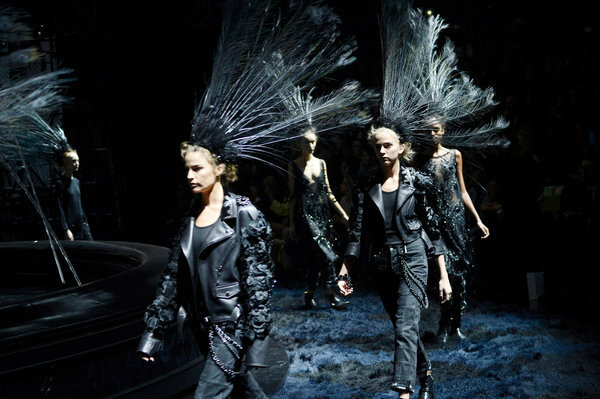 The models, with their giant Folies Bergère feather headdresses and jet-embroidered chiffon, looked dramatic. But they gave the impression that the party performance was over, not least because bluejeans were often worn under the finery as if the dancers were making their way home. The perennial interest in our first black international star seems to be on an uptick again. Huffington Post put this style feature-ette about Josephine Baker up today–with a very glossed over mention of her “dark skin” when in fact the fairness of her skin was just as problematic: http://www.huffingtonpost.com/2013/05/14/josephine-baker-beauty-photos_n_3267033.html Colorism anyone? As specialist on this area, I find the enduring fascination with La Baker fascinating. In the public imagination and the scholarly literature, La Baker has become touchstone for the era that far exceeds in some respects the fame that she had during her heyday between the Wars.